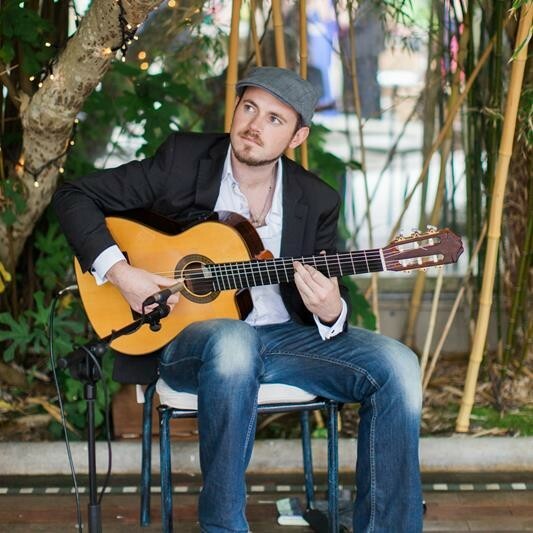 John Walsh is Ireland's leading Flamenco Guitarist and Composer. If you are looking for something truly unique, atmospheric and memorable for both you and your guests on your wedding day, look no further. John will set the perfect atmosphere for your pre-dinner reception and provide the most beautiful background music for your guests to mingle and chat. In addition to extensive experience performing at weddings (ceremonies both religious and civil, drinks & pre-dinner receptions) John has performed for President Michael D Higgins, composed and performed music for Ireland's National Ballet, appeared as the invited international artist at a major Flamenco festival in Spain(the first Irish person to be honoured by such an invite), performed live on TV & Radio in both Spain & Ireland and played in most of the main theatres in Ireland, including the National Concert Hall, Gaiety Theatre etc. John is professional and discreet and you can be sure that having him perform will create an unforgettable atmosphere and experience for you and your guests. In addition to Flamenco & Spanish music John can perform classical, contemporary, jazz arrangements, Latin, Bossa Nova and more.. If you or your partner has a favourite song that you would love to hear during the ceremony or pre-dinner reception just name it and John can make a guitar arrangement on request! If you are looking for a particular mood for the performance just get in touch and John will tailor a set-list appropriate to it. John is a remarkably talented player but very down-to-earth and easy to deal with. We originally booked him to play flamenco at our reception, but also played before and during the ceremony. He arranged a song he was previously unfamiliar with to accompany our singer which made the whole experience more integrated and much better. The flamenco was the highlight for me and it's one regret from the day that I didn't get to spend more time at the reception to enjoy his mazing playing. If you love guitar music, book him! One of the highlights of our wedding was John's fantastic ceremony music. From the very first email exchange with John, he was so helpful and accommodating, providing us with a lot of guidance and information right from the off. It was also a great help that he is one of the most talented musicians we'd ever had the privilege of hearing! We also had a friend of ours who is a violinist involved in the ceremony music and John had no problem in chatting with her and arranging the accompaniment. We also had a very specific song request for inclusion in the ceremony and without any hesitation John learned it for us and did a fantastic job! So many people mentioned to us afterwards how much they enjoyed the music, so we couldn't thank him enough! John also then played a selection of Spanish & Flamenco music for the hotel drinks reception, which went down a treat with us and our guests! If you are having any dilemma about what to do for ceremony music, don't hesitate in contacting John. He really made our day very special, so we couldn't recommend him highly enough! Thank you so much for playing during dinner at our wedding on 4th August 2017. You were absolutely fantastic we thoroughly enjoyed listening to you play and our guests really enjoyed it also! Your music really added something very special to the evening! Thanks so much John and best of luck in the future. John Walsh can only be described as a creative musical genius!! He is absolutely gifted. He flawlessly played guitar for our Catholic Church ceremony - he played a mixture of classical, traditional and contemporary. He also played at our drinks reception setting the relaxed and chilled out tone for the day! Everyone commented on the music! It went down a treat! He provided us with lasting memories of the best day of our lives. John genuinely cares about the happiness of the bride and groom. He is down to earth and so interested in what he does. Have him at your wedding, and I promise he won't disappoint. I cannot recommend John highly enough! He has been so thoughtful and attentive in selecting the music for our wedding ceremony in the lead up to the day itself, giving so much of his time. He really takes the time to ensure you are getting exactly what you would like and talks you though considerations that I would not have thought of, for the day and atmosphere being created. 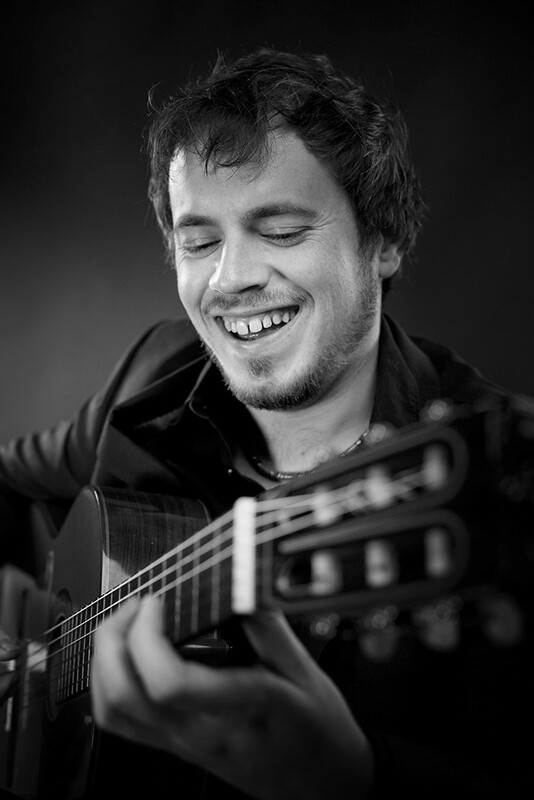 He is extremely gifted and skilled guitarist - playing a mixture of contemporary and classical pieces for us. He is also very professional and arrived early to play for our guests, creating an atmosphere before its even begun, whilst being very discreet. Everyone commented on the fantastic music and I couldn't be more grateful to him! My partner Iain and I got married on 13 April 2017 at the Angler’s Rest and John played at both our ceremony and afternoon drinks reception. We were so happy with his music—and in fact, we knew we would be, having heard John play (absolutely beautifully!) at a friends’ wedding a few months before. In the months leading up to the wedding, John gave us really sound advice about how to structure and order songs for the ceremony and communicated all of his suggestions patiently and clearly. 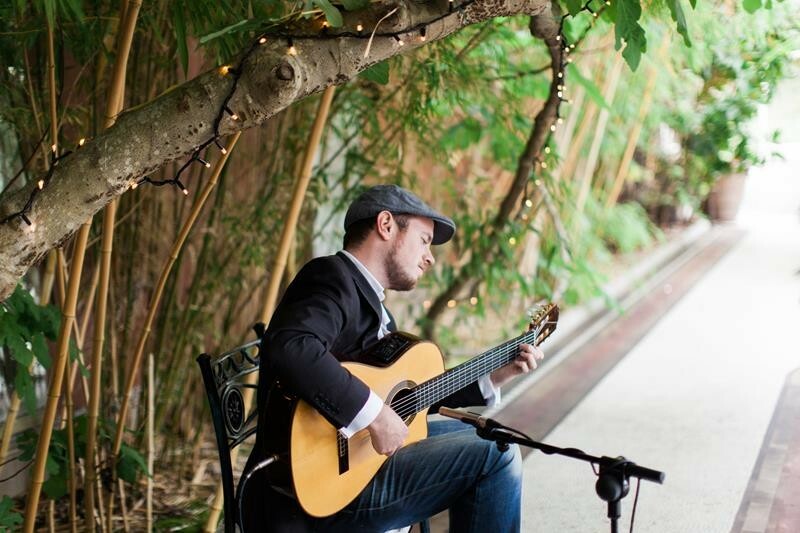 While John specializes in flamenco-style compositions, his skillfulness allows him to be adaptable to a wide-range of musical styles and tastes and he was certainly accommodating in arranging our (jazzy) song choices for the ceremony. We can’t recommend John enough: his music made the day so special and we couldn’t be happier. Thanks so much John! John played at our wedding ceremony and drinks reception in Horetown House in April and we couldn't recommend him enough! His style is just a beautiful. Very professional, lovely guy to deal with! Took all of our music tastes on board and recommended some really lovely additions to our ceremony music! Our guests loved him and are still talking about it! Thanks so much John! John has a very friendly nature, but moreover he is extremely talented and brings a natural flair to his trade which is second to none. Our guests were charmed by his flamenco-style classical compositions, and he was very flexible in adapting the music we requested for our service. We hired him for both the marriage ceremony and the afters, and would highly recommend him to all. I highly recommend John for your special day. John played at both our ceremony and drinks reception. The first sign of Johns professionalism was through his website. It was so easy and accessible to hear John’s renditions in our own home, which really helped us focus on the actual music. From the moment I reached out to John he was really attentive and had a wide range of material to choose from. He was also flexible and more then willing to learn anything specific if requested. As every bride knows the day flies in with so many emotions, friendly faces and loved ones surrounding you, but I clearly remember the lovely atmospheric music from John throughout the ceremony and reception. I personally think that takes some skill to leave that impression. John also made sure to check in with us on the day to ensure we were happy. I had such great feedback from my guests as well, everyone really enjoyed the ambience John created for the ceremony and reception. Thanks so much again John from both Dave and I.
I couldn't recommend John Walsh highly enough. He was so easy to deal with and so accommodating. He has a long list of songs to choice from and is very familiar with different types of wedding ceremonies ( ours was spiritualist ) so he was able to recommend what would suit when . He arrived over an hour early and played beautiful music while our guests arrived in. His guitar never ended abruptly and he flowed beautifully inbetween readings and the celebrant etc. The song choices were really relevant and personal to us and my friends said it was like a playlist I would make! I was so happy that John was also able to arrange and play Tender by Blur for my walk down the aisle as I am an absolutely massive Damon Albarn fan! He couldn't have been more down to earth and is also super value for money considering his experience and skills. He also played for my sisters wedding last weekend and the guest loved it. Thanks so much John! We were so delighted to have John play at our wedding. He was brilliant on the day and so helpful in the run up, nothing was too much trouble and he understood exactly what we were after. Couldn't recommend him highly enough. Lovely guy, very down to earth and a fantastic musician. He played the songs we chose beautifully...everyone was very impressed by the music! John played at our wedding and drinks reception in October 2016. We chose John as we wanted something more relaxed and personal than the usual string section and there are a number of musicians in my family so I knew that we'd need a real pro to please the crowd! He is an excellent musician and really a pleasure to deal with. John learned a song just for us and it really was one of the most unforgettable parts of the day. Many of our guests commented in the beautiful ceremony music and how it was very 'us' rather than the usual wedding fare. At the reception he played a variety of songs and styles which was a perfect backdrop to our guests mingling. Our only regret was being so busy we didn't have a chance to appreciate him ourselves so we subsequently went to see him in the National Concert Hall. Thanks so much John for being part of our day! John really was one of the highlights of our wedding day. His playing at both our ceremony and our reception was simply exceptional and not only were all our guests extremely impressed with John's classical guitar skills but our priest and the wedding venue owners were too! Not only is John a lovely guy and an outstanding guitarist but he is extremely professional and was great to work with from the very start. He was very quick to return any emails and he was happy to speak with us a few times before the wedding in order to discuss our music selection. He put us completely at ease and with his experience he was able to help advise us on what pieces he felt would work well during our ceremony. The result was perfect. Our only regret was that we couldn't have had him play for us all evening long! Firstly, John is a lovely friendly guy, just a great person. He was so relaxed with everyone. He interacted with the guests brilliantly and wowed everyone while keeping to what we asked. So easy to deal with. The real winner though was the double act himself and the Priest came up with but that's down to how friendly he is. You'd think they'd been working with each other for years. We are pretty clueless about music (only suggested 2 songs from the list John suggested) and the guitar has a Spanish feel (we've not connection to Spain) but it made zero difference. Everyone loved the quality, style, volume, little bit of banter. We had John for the service and a couple of hours in the hotel before the meal. It was the best thing we could of done. You know by the quality of John's work he won't be playing weddings for much longer. John performed at an outdoor BBQ we held the day after our wedding. The flamenco guitar was a fantastic addition and beautifully complemented the ambiance of the day. We also requested a change to times just a few days out and John was very accommodating - a pleasure to deal with. Looking back on our wedding day, one of the stand out memories Was johns guitar playing. It was beautiful. Many guests commented on the music throughout the day , with one taking his details to enquire for his own wedding. John made it all very easy to organise our ceremony music and we felt confident with our choice from day one. I would highly recommend John. 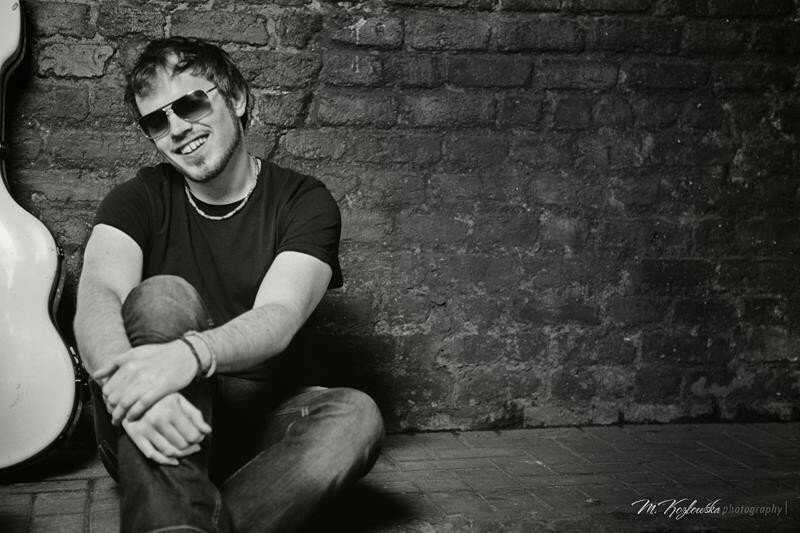 His music and talent is amazing. John provided the music for our humanist ceremony and garden drinks reception at the Merrion Hotel in Dublin. From start to finish, he was really a pleasure to work with. We live abroad and so didn't have the chance to meet with John until the day, but that didn't matter at all. We organised everything easily by phone and email. John is a very talented musician, so after he helped us to choose a few specific songs for the ceremony, we were fully happy to let him play what he wanted for the rest of the day. It worked out great - the guests raved about him! John was also happy to prepare a new arrangement of one of our favourite songs for the bridal entrance. Having one of the key elements of the day in the hands of a true professional like John really made the planning process a lot easier. I would highly recommend him! John is an outstanding player and is very professional his talent is second to none! You will not be dissapointed! Book book book! John played our wedding ceremony and cocktail reception in Waterford Castle and I can't recommend him highly enough. He's a lovely guy, extremely talented and very responsive to emails, which was great as we were planning our wedding from overseas. His guitar filled the room perfectly and wasn't overpowering for guests sitting upfront, which we were afraid of with a string quartet. John worked with our solemnizer to ensure all went smoothly on the day, and moved from room to room as the wedding progressed to ensure maximum enjoyment for our guests. John, was a pleasure to deal with. His flexibility to accommodate special requests as well as his willingness to help was second to none. The music he chooses and the atmosphere that he creates is something that every bride and groom hopes to achieve from their wedding reception. We would highly recommend him for any wedding....so much so that he played at our best friends wedding as well. John was exactly what we were looking for to provide the perfect ambience for our ceremony and drinks reception. I would not hesitate in recommending him for any occasion. Just take a listen to him and hear for yourself. John Walsh was fantastic. He was very flexible, gave us advice on which songs would suit (and which would not!). He played the songs we selected for the ceremony beautifully. He played during our drinks reception too. So many of our guests commented on how well he played! He is also a very nice, funny and calm guy - great to have around on your wedding day! John played at our ceremony over the weekend and i don't think i could thank him enough. He is a true professional, both leading up to the day and on our wedding day. Even when we requested Metallica he made it work :) the music was flawless and beautiful plus he is such a nice guy to deal with. Everyone loved the music and it was the talk of the day. One of the best decisions we made for the wedding was to have John play. Thank you, Thank you, Thank You. We would highly recommend John to everyone. Review by Such beautiful music. I can´t recommend John enough, we were so happy with our choice. The atmosphere at our drinks reception was so intimate and relaxed and many people commented on how lovely it was. My husbands family are Spanish and there are a few flamenco players among them and they were particulary impressed with his playing. If you are loking for something a little different I really recommend John.His music was really beautiful and perfect for our day. John played at our intimate wedding ceremony in Ratoath Church and it made the whole thing even more special. I was worried about the church feeling a little empty as there were only twenty guests but John's music filled the space beautifully and made everyone feel relaxed and welcome. He is extremely talented and a joy to listen to. He was also great to deal with, with quick and helpful responses to any queries I had about the music. He was flexible about choices of music and good at suggesting what would work best for each part of the ceremony. He arrived an hour before the ceremony to make sure he had everything set up to his liking. I would highly recommend him for any wedding ceremony to add a unique and special touch. Review by A Wedding with a Special Something! We recently got married in Kilkenny's Rivercourt Hotel and John provided the music at the ceremony and then after at the reception until guests were called for dinner. We have to say that from the time we contacted John he was both professional and friendly. We had a song that we wanted played while walking into the ceremony room, this song was by a piano player by the name of Yiruma. We asked John would it be possible for him to learn this song on guitar. There was absolutely no problem and on the day he played it beautifully! It was a pleasure to listen to him play this piece of music which would be a favorite of ours. We talked about other songs to play and John knew exactly when to come in with them and when to end them! Perfect timing! John arrived at the hotel long before he started playing to set up etc., and as said previously he then played at the reception in the bar to the guests while we went and got photos taken. We have had nothing but positive comments about Johns music and how nice it was to sit and chat with other family members and listen to John playing. From the time we contacted John he was very obliging and nothing was a problem to him. We would have absolutely no problem in recommending him to any couple who want that something special for their big day and who want something a little different. Johns flamenco playing at the reception gave a lovely summer feeling to the day! We wish John every success with his career and the best of luck for the future and we will definitely be seeing him play again sometime soon! John was so professional to work with. He got back to me straight away when I contacted him. My guests absolutely loved his music and thought it was a refreshing alternative to the norm. I have no hesitation in recommending him for any occasion! Such a lovely guy! We cannot recommend John highly enough. 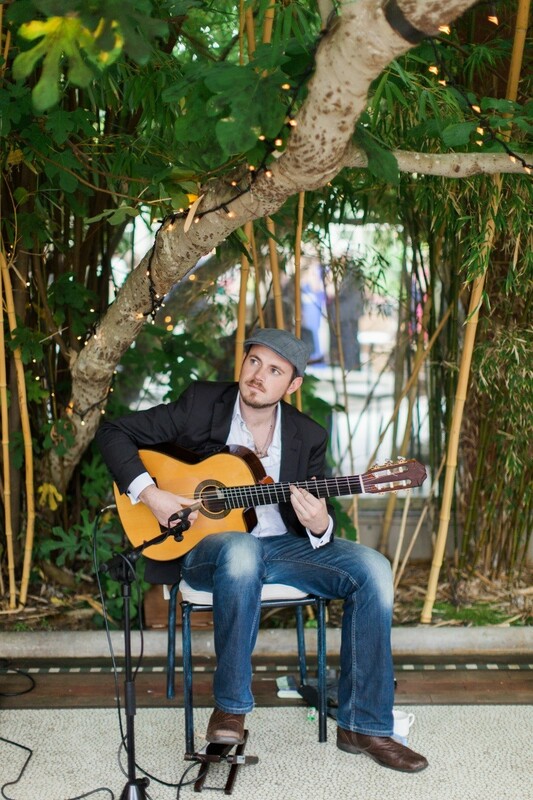 He played spanish guitar at our wedding reception which created a really beautiful, relaxed, fun atmosphere. All the guests loved it! He is very flexible & very professional. He helped us organise the type of music we wanted. He was very easy going, played for the full duration of the drinks reception which went over the agreed time (most musicians will not provide this service and are very strict on times) & his price was extremely good value. We spent quite some time shopping around -his was definitely the best value & he is an outstanding musician - a gem of a find. We cannot recommend John highly enough- you will not be disappointed - he is a brilliant musician & very professional. From first point of contacts, John was always quick to reply to emails and very flexible with great suggestions.my friend sang a couple of songs at the ceremony and he met with her for practice sessions. He was open to learning new songs.his rendition of blackbird and here comes the sun was beautiful. I would highly recommend John for a church/ civil ceremony and reception drinks. I booked John to play during my ceremony as a surprise for my husband and he did not disappoint!! John was extremely helpful in recommending songs and made the whole processes so easy, especially as I was organising my wedding from England. I walked up the aisle to 'A Thousand Years'. 'Recuerdos De La Alhambra' and 'Thinking Out Loud' played during the ceremony and we walked down the aisle to 'Nothing Else Matters' by Metallica! Everything sounded absolutely beautiful on the acoustic guitar and John can literally put his hands to anything you suggest! I would recommend John in a heartbeat. Everyone loved the music and it made the ceremony! It was one of the best decisions I made for my wedding day! 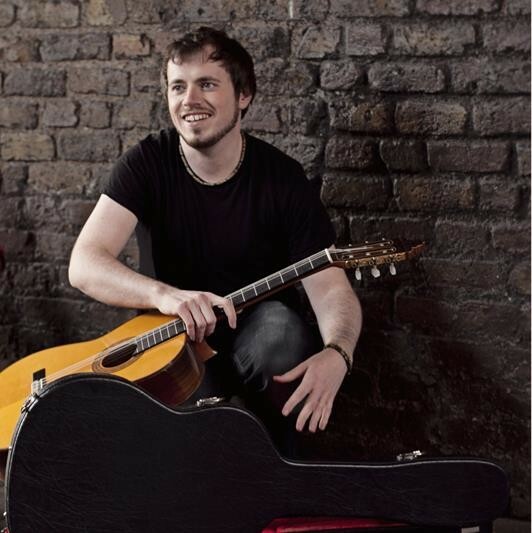 Get 15% Off your Wedding Ceremony & Drinks Reception Music with John Walsh Guitar!